As part of the recent Clans and Surnames of Ireland event in Nenagh, we took a field trip to the nearby town of Portumna, Co. Galway. 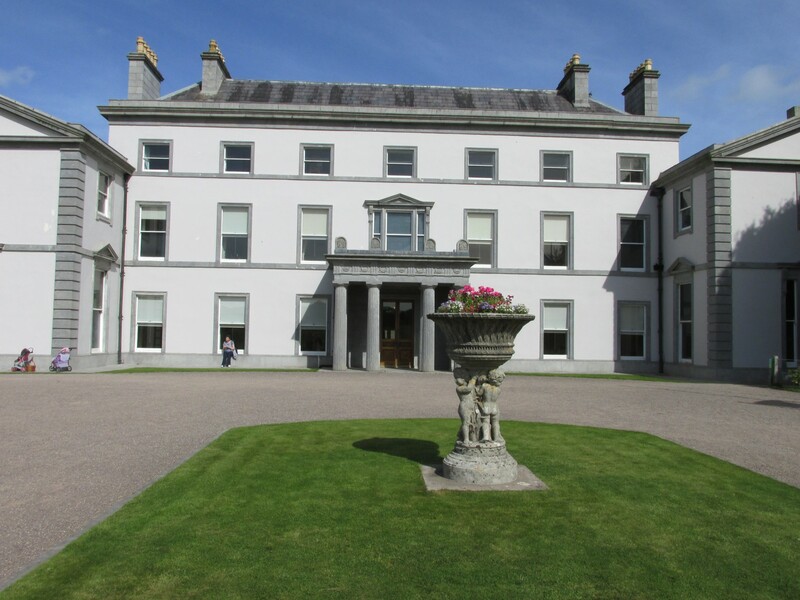 The purpose of the journey was to visit the magnificent Portumna House and the Irish Workhouse Centre. Portumna Castle is a semi-fortified stately home which was originally built in the early 17th century as home to Richard Bruke, the 4th Earl of Clanricarde. It was occupied by his descendants until a fire destroyed most of the building in 1826. The house is undergoing significant restoration by the Office of Public Works and currently the ground floor is open to visitors, along with the gardens. We were treated to a talk by the always entertaining and informative Kenneth Nicholls, who went through the history of the family. A few hours spent taking in the splendour of Portumna Castle and the gardens was impressive enough but that was followed up by our visit to the Irish Workhouse Centre, which was on the other side of Portumna. It’s certainly difficult to find a greater contrast between the splendour of Portumna Castle and the grim reality of the nearby workhouse. Going from one to the other, even on a bright sunny day, can be particularly jarring. Plenty has been written on the horrors of the workhouse system in Ireland and the squalid conditions that those unfortunate enough to end up there had to endure. It should be noted that the workhouse in Portumna wasn’t among the worst of these institutions. It was built after the Famine, mainly to take some of the overflow from other workhouses in the region. However, conditions inside were far from pleasant. Families entering the workhouse were separated, with little hope of seeing each other again. This included taking children from their parents. Often the only escape was through emigration. The workhouse and the stately home might seem to exist in completely separate worlds but they were closely linked. The landlord of the area, or one of his representatives, often served on the Board of Guardians for the workhouse and would have plenty of influence on the conditions endured by it’s residents. Not least in paying for assisted emigrations, which offered an escape from the workhouse. What caught my eye during the visit to Portumna was in the room once used by the Board of Guardians for their meetings. The windows allowed plenty of light in, however the window facing out into the interior courtyard (where the residents would have gathered) was high up on the wall. This meant that while the room was lit, those meeting in the room didn’t have to concern themselves with any views of the abject poverty on the other side of the wall. Although many records concerning admissions to workhouses in Ireland have been lost, many of the minutes for the Boards of Guardians still survive in local archives. You can find a list of workhouses in Ireland and the location of surviving records here. When researching your family history it is worth remembering to look at both sides of the social spectrum in order to fully appreciate the times they lived in. Posted on June 17, 2017 by daithi82. This entry was posted in Genealogy, History, Uncategorized and tagged Archives, Clanricarde, Clans and Surnames of Ireland, Emigration, Family History, Galway, Genealogy, History, Ireland, Irish Workhouse Centre, Landlords, Poor Law Unions, Portumna, Portumna Castle, Tipperary, Workhouse. Bookmark the permalink.